The sleepy town of Sonoma is celebrating the inauguration of a new music festival this year. 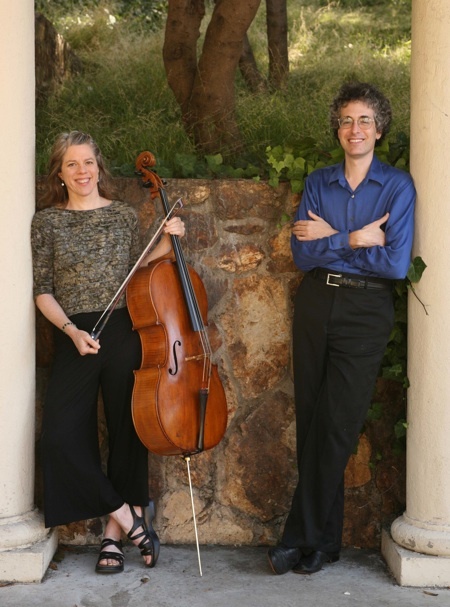 Sited in a bucolic vale but easily accessible to the Bay Area, the Valley of the Moon Music Festival is the brainchild of a well-known East Bay duo, pianist and composer Eric Zivian and cellist and early music enthusiast Tanya Tomkins. Their creation is unusual in two ways. The programming is drawn from the classical and romantic repertoires, but performed on the earlier instruments it was designed for. This may sound subtle, but makes a real difference. Modern instruments have evolved along with the grander scale of our auditoriums to produce a bigger sound that will project into those larger spaces, primarily by using steel strings and more tensioned bows. But there is a cost: the instruments of Schubert’s day, with their gut strings and looser bows, gave a more intimate and responsive sound. Harmonies were tighter, if less powerful. Double stops, or chords, were easier to play on the less tensioned strings, and older cellos had an agility that their more resonant heirs cannot equal. The other unusual feature is the way they tie in their educational component. While well-known festivals like Music@Menlo have free “Prelude Performances” of their already accomplished students before each main concert, this festival takes it another step. Along with daily master classes for a group of five choice young talents, their evening concerts include those apprentices playing alongside more accomplished performers. On Sunday afternoon, July 26, their program opened with Schubert’s Sonatina for Fortepiano and Violin in A minor. 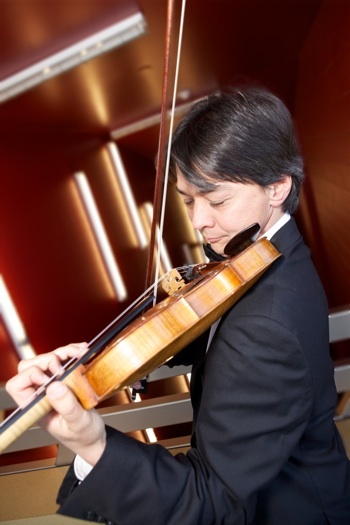 Ian Swensen, a local violinist with a national reputation (and a founding advisory board member of the Piedmont Center of the Arts), restrung his violin with natural strings, softer and more easily stretching out of tune. Swensen’s sound was intimate rather than forceful. “He isn’t trying to milk the sound,” said audience member (and fellow music critic) Ken Bullock. And indeed, this violin part is more often overplayed. Swensen showed us a young and interior Schubert (he was only 19 when he wrote this), hooded and a little tentative. It was a private moment with slippery notes and bowing that sketched the fragile melody rather than biting into angst. “The Sonatina is meant for a very small room to play for a couple of people,” prefaced Zivian. “It’s quite melancholy and dark.” He accompanied Swensen on a restored 1841 Rausch piano. “It has a wood frame, rather than the cast iron action of today, with more resonance in the bass notes and lighter on top.” It became clear that a modern piano would have muddied their nuances. But there was still plenty of room for drama! It is arguably one of the great works of the Romantic literature, and performed by three great pros and two newcomers with huge sympathy and lovely colors. Vera Beths arrived from Holland to lead the group, playing the first violin part with empathy and breath-stopping sweetness on a 1727 Stradivarius. Elizabeth Blumenstock, a concertmaster of Philharmonia Baroque and American Bach Soloists, took the viola part with great energy, and Tanya Tomkins anchored them in the sumptuous resonance of the low cello line. Laura Gaynon, who has already begun to launch an impressive career, played the upper cello part and the second violin part was performed with warmth and tension by 22-year-old Augusta McKay Lodge. Prepared for an older era, these five instruments came together in harmonies that simply melted, and it was in those tender accords that one could most clearly hear the argument for period instruments. After a movement that immortalizes simple hopes, we came to one of the great Adagios of all time, slow and sublime outer sections around a center of yearning intensity. They returned to rich chords and fierce gallops, Hungarian fiddle themes and subtle variations. This is a work about which one could write at length, or simply stop in one’s tracks and wonder at the feathered weight of angels. There are three more concerts in this series, Friday July 31 at 7:30 p.m and Saturday Aug 1 and Sunday Aug 2 at 4 p.m., all at the Hanna Boys Center Auditorium in Sonoma. See valleyofthemoonmusicfestival.org for directions and information. Photo top of violinist Ian Swensen; below, of Festival co-founders Eric Zivian and Tanya Tomkins.